Ardyne House is a well-appointed ground floor apartment located on the seafront in the outskirts of Port Bannatyne. 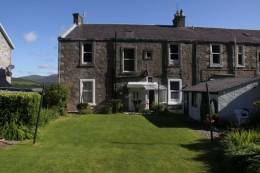 It has outstanding views across Kames Bay towards Loch Striven and the Cowal peninsula. To the rear of the house there is an enclosed shared garden which is a suntrap in the morning and afternoon. Ardyne House has double glazing and gas central heating throughout. Free fibre broadband internet is provided.